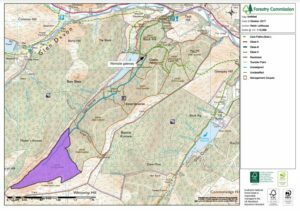 Forestry Commission Scotland (FCS) have informed FotO of a large felling operation about to start in Glen Sherup Forest as shown in purple on the attached map. There is a large volume of timber to fell and extract, and as such works will last for approximately 8-10 months depending on the severity of the winter. It will be noted from the map that this operation will not directly affect the core path leading up to Glenquey Hill or the waymarked WT reservoir trail, however there will be regular timber haulage on the forest road down through the main car park. Operations will affect general access-takers wishing to go up the main haul road leading directly to the worksite. FCS will be actively discouraging access up / down this route whilst the site is live. As such, barriers and safety signage will be in place at the bottom junction, with signage also placed on the rough track leading down from Whitewisp Hill area through the adjacent restocking area. FCS will be monitoring the condition of the access road throughout this operation to ensure that visitors and residents can continue to access the Glen Sherup site safely.